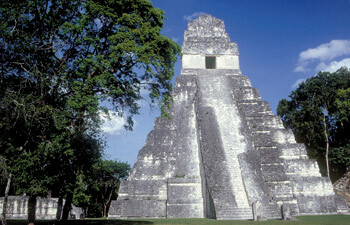 Guatemala is one of the world's most famous tourist destinations. 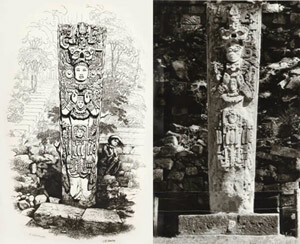 It has been on the map for world travellers since the mid-1800s, when John Lloyd Stephens and Frederick Catherwood documented ancient Maya ruins buried in the jungle, as they trotted back and forth across Central America trying to present their diplomatic credentials to an ever changing government. The legendary, and eccentric, photographer Eadweard Muybridge gave it another boost in the 1870s. After his acquittal for the murder of his wife's lover, he hid out in Guatemala, where he created a magnificent portfolio of photographs, an important part of which is at the Museum of Fine Arts in Boston. The ground was entirely new; there were no guide-books or guides; the whole was a virgin soil. At one time we stopped to cut away branches and vines which concealed the face of a monument, and then to dig around and bring to light a fragment, a sculptured corner of which protruded from the earth. I leaned over with breathless anxiety while the Indians worked, and an eye, and ear, a foot, or a hand was disentombed. Here were the remains of a cultivated, polished, and peculiar people, who had passed through all the stages incident to the rise and fall of nations; reached their golden age, and perished, entirely unknown. The links which connected them with the human family were severed and lost, and these where the only memorials of their footsteps upon earth. 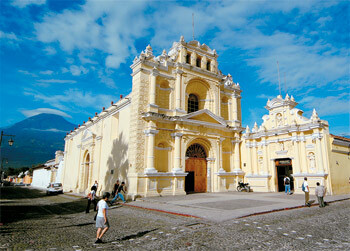 Today, 900,000 travellers visit Guatemala each year (40% from the United States and Europe ). While the country still echoes its exotic past, it is fully geared to the modern tourist and business visitor. 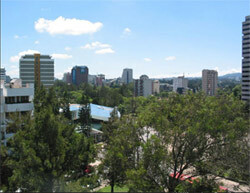 Guatemala has the largest economy in Central America and its capital, Guatemala City, is the hub of business activity for the region. A sophisticated network of infrastructure has been developed to accommodate both pleasure and business travellers. An astonishing array of topography, climates, vegetation and animal life got packed into just 109,000 square kilometers (42,000 sq. miles) . . .
towering mountain ranges, scruffy deserts, cloud forests filled with mist, jungles filled with wildlife, highland plateaus, black sand beaches, great rivers, crater lakes, active volcanoes, brilliant blue skies and tropical deluges are just part of what the country has to offer. People are another Guatemalan treasure, both the ancestors and the living. The ancient Maya civilization keeps archeologists digging at dozens of sites around the country. Their modern descendants, concentrated in the Western Highlands, give tourists first hand lessons in the price system and leave them with a desire to return. Guatemalans are exceptionally friendly and receptive to tourists. Most speak a little to fluent English and bend over backwards to make the stay of the visitor enjoyable. Guatemala 's three most famous attractions are the town of Antigua, the crater lake of Atitlán, and the ancient city-state of Tikal, buried in the northern jungle. Antigua, just an hour from the capital, was the colonial capital of the Spanish Captaincy General. Today, it is one of the best preserved and most charming colonial towns in the hemisphere. 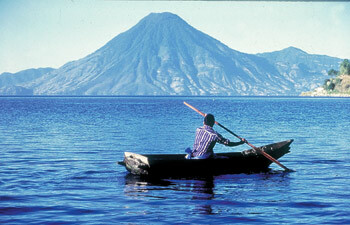 Decades ago, Lake Atitlán almost set an early tourist, Aldus Huxley, to swoon. Lake Como, it seems to me, touches the limit of the permissibly picturesque; but Atitlán is Como with the additional embellishments of several immense volcanoes. It is really too much of a good thing. The temples of Tikal rise above the jungle canopy home to howler monkeys with their fearful roar and spider monkeys who shake tree branches at bothersome tourists below. Another of Guatemala 's fabled attractions is its well earned reputation as the "land of eternal spring." Most of Guatemala is in the mountains, so temperatures are mild year round. In November the weather is better than perfect. Indeed, it is the best time to visit Guatemala : skies are brilliant, vegetation lush and temperatures unbeatable-warm (but never hot) by day, with sweater weather in the evenings.